Molded low in front and high in back. 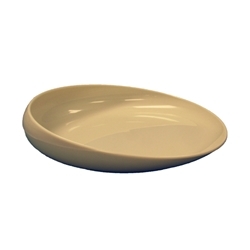 Unbreakable, 8" round scoop dish is nonskid with rubber-padded bottom for control when scooping. Washes in top shelf of domestic dishwashers. Not recommended for microwave. Latex free.